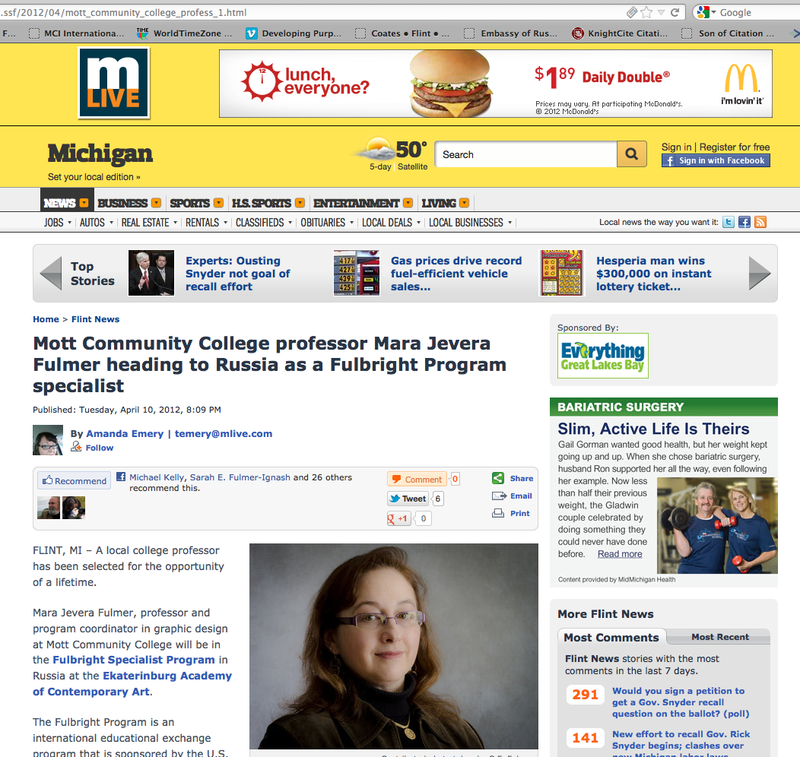 Article from MLive (Flint Journal) about my upcoming trip captured lots of attention from friends, neighbors and colleagues. A little too much attention. But I'm glad it's making folks happy about one of their own getting this honor. So I guess this is where the community gets really excited about my Fulbright grant to Russia, while I’m just a bit nervous. I’m not very good at getting lots of extra attention. But on this subject, outwardly, I may appear to be ambivalent. But inward Of COURSE I’m honored! and OF COURSE I’m excited! But don’t confuse my lack of an excited outward demeanor for ambivalence. It’s actually that I’m very very focused on what I must do to prepare. There is just so much to do, and I feel extremely responsible to so many people to make sure that I do it well. In essence, I want to make sure I’ve really earned all the accolades that are coming in ahead of this trip. So, while I am outwardly quiet or maybe distracted, I’m actually quite focused on the juggling and keeping up with the many tasks to be done ahead of time. Rest assured, as soon as I’m on that airplane and there’s nothing left to do but get to Russia, I’ll be secretly dancing a little jig of excitement! And once I’m there, though I’m sure there’ll be a few unnerving moments now and then as I deal with the unfamiliar, I know that my hosts are also a little nervous about meeting me, too. Together, we’ll have some fun getting to know each other and sharing in some new adventures. Yes… the more I think about it, the more excited I become. It should be a great adventure and learning experience! Nice side note: The photo is by my daughter, Sarah Fulmer, who is a professional photographer. See her work here.